Google is pushing out a major update to Android Wear that will activate the speakers on certain smartwatches. 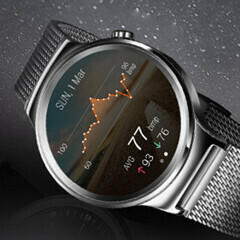 Timepieces like the Huawei Watch and the 49mm Asus ZenWatch 2 each come out of the box with a speaker, allowing users to make or take calls using Bluetooth. However, the speaker needs to be activated by Google, which it is with this update. Using an app like Glide, those with the Huawei Watch or the ZenWatch 2 (49mm) can listen to audio/visual messages following the update. Other changes include the addition of new gestures to make navigating an Android Wear timepiece easier. Flicking your wrist will allow you to scroll up and down your card stream. Certain gestures will allow you to expand a particular card, bring up your apps and return to the watch face. The update will also allow users to send messages using a voice command. Certain messaging apps like Google Hangouts, Nextplus, Telegram, Viber, WeChat, and WhatsApp will support this new feature. You will be able to say, “OK Google, Send a WhatsApp message to Charlene: The Panthers will win the Stanley Cup." finally...i can't believe this and nfc features are still an afterthought. The Sony SmartWatch 3 is the only Android Wear watch that had NFC. That is another thing that has to be activated in Wear. However with that said, I can still pay for some things using barcodes on my watch. Like Starbucks and Tim Horton's, there are others as well. Glad I haven't bought an Android Wear device yet with the lack of features yet activated and not enough independence away from a phone I was hoping for. Hmmm. My $50 LG G Watch works excellent for only $50. Although I'm a Letter Carrier so I work in a job that having controls on my wrist is VERY handy. So the speaker in the Zenwatch 2 sounds very tempting to me. Baracus please list all the other features not activated. Android Wear already has WiFi, Bluetooth, GPS, compass, barometers, accelerometers, gyroscopes, pedometers, temperature, heart rate monitors, light sensors, all kinds of screen sizes and types of displays, and now speakers. It's great that Android Wear now has speaker support. However if you wanted to listen to music or podcasts, you could always do that with any Android Wear device. Users could listen if you have a Bluetooth headset or speaker. Developers have the ability to create native Wear apps or Android phone or tablet apps that have Android Wear functionality. Doesn't allow connecting over wifi independently from phone. I just want the connection issues to get fixed. I love android wear... Just wish it worked! Glad I picked up the Asus zen watch 2.